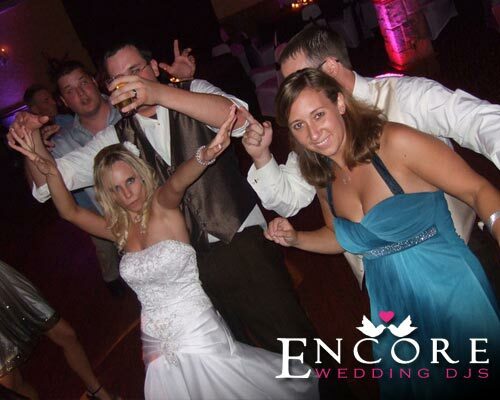 This reception came to Encore as a referral and it was a COMPLETE slam dunk! It was a little bit of a drive to get to Lakeview Golf and Resort, once there we immediately began setting up our lighting fixtures. I must say the lights complete transformed their room. Once we setup the lights, guests started arriving and we could hear them complimenting us on the lighting. This couple was amazing… they had a great group of friends and family. And it was the first time that I ever seen anyone “dragged” across the dance floor (in beat to a song). There are too many great highlights for this post to deserve just one mention. First I have to leave a link to were to can read thoughts from Nichoal and Anthony HERE. Btw, we also had a monogram aimed behind the head table during dinner and it looked stellar! Oh yea… this was a fun group of people! I’m sure you have some stories of guests at receptions lol!